Wow! Impressive to say the least! Did you make your own controller, or are you using modifications of those used in the F@H or RepRap projects? Right now, I use all standard RepRap electronics on my machine. That’s great to know. I’ve been planning my own printer build for the past few months and have been toiling over which project’s electronics to use. Can’t wait to see more of the build! 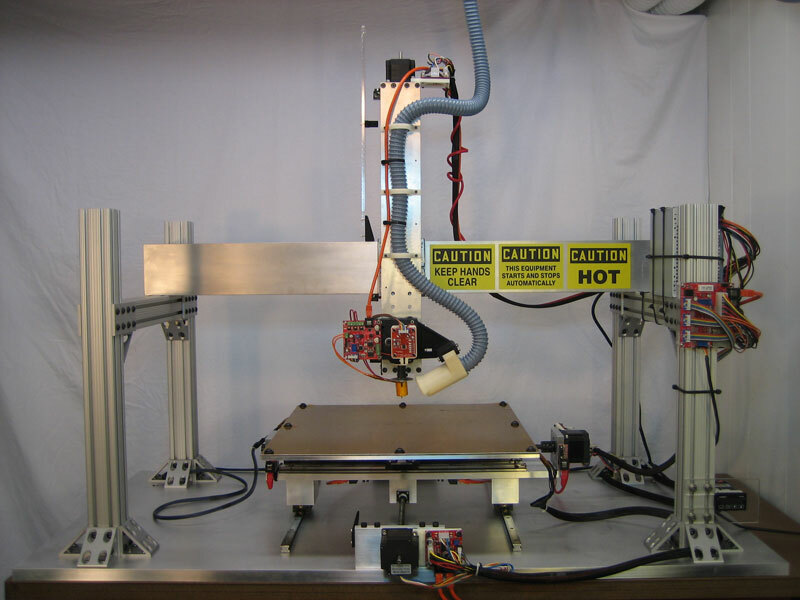 Hello, your machine seems to be far superior to either the mendel, or the fab@home v2 or the maker bot. Are you planning on releasing parts lists and drawings and whatnot to facilitate people replicating your design? Drop me a line on email if you have a moment, I’d love to discuss your project with you. The machine is still a work in progress (I’m always trying to make it better), so at this time I don’t really have plans or a bill of materials available. When you do decide to release a build plan on this I am very interested. I use Alibre so I will have to see about converting the files to STL. Very nice work. I have to give you my compliments for your very good looking quite large and pretty accurate 3d printer. But what makes me wonder is: as far as I can see, the four vertical stands and the connecting horizontal beams do nothing else than hold the print head and Z axle. It’s probably a very rigid construction but so are those good old bench drills and mills with much simpler constructions. Your construction would make sense to me if you would have used it as a portal with the print head moving in XYZ directions. Am I missing the point?